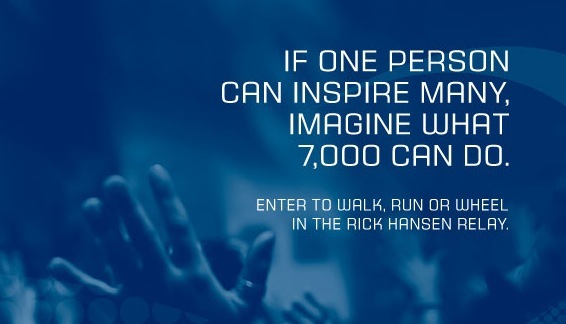 Chris Wheeler Media is excited to announce that we will be filming the Rick Hansen 25th Anniversary Relay. We will cover the journey providing broadcast packages and posting web episodes of the relay from key locations across Canada. We are honored to join such an excellent team and to capture the inspiring stories of the many in motion participants. Beginning on August 24, 2011 in Cape Spear, Newfoundland and Labrador – the easternmost point in North America – the 25th Anniversary Relay will retrace the Canadian segment of the original Tour, but this time one man in motion will be represented and celebrated by many in motion; engaging 7,000 participants from across Canada who have made their own difference in the lives of others. My grade 4s and 5s look forward to following all of your videos as you travel with the Many in Motion tour across Canada. You make our learning so authentic, as you capture the essence Canada and its people in your videos.